Hubble, bubble, toil and trouble …and that’s just before the race. Good news. I had finally shaken the cold that had been bugging me for the two weeks since my last trail marathon. Bad news. I mean really rotten luck. I had picked up the stomach bug our family had been gifting to each other. Urgh. On race morning I woke up at 5.30am hoping to find myself recovered only to spend 30 depressing and memorable minutes in the bathroom. Here was a tempting Coastal Trails race – one I hadn’t done before which is always a treat. Images of beautiful forest were calling to me and the relatively low elevation at just over 3, 000ft was converted in my mind to something gentle and manageable for a sick person- amd it was just 40 minutes away. I deployed all the advice I had gleaned off the net to see if there was any way I could conquer the ‘D’ word before the 8am start. 1) I cut out my usual race day morning tea followed by very strong coffee, instead forcing myself to drink four large glasses of water. My research had told me ‘D’ is exacerbated by as well as the cause of dehydration. I actually made the coffee and sniffed it. Sad addict. 2) Clearly I couldn’t race like this so I took some Imodium. A horrid risk as I’ve never taken it before but there was nothing to lose. (no pun intended).The net is full of grateful runners swearing by it – not for daily use but for long runs/races. 3) Read all packaging. In a comic moment I turned the packaging over in my hands after swallowing the pills and read the possible symptoms for the first time. ‘May cause drowsiness, fatigue, dizziness’. Nothing that should pose a snag when running a marathon then. Lol! 4) If you want these things to work well you take them on an empty stomach and don’t eat for 2 hrs after. I had taken them just before 6am and the race started at 8am. I normally fuel up an hour before a race. What to do? In the end I ate a quarter of what I normally do before a marathon and planned – if I started the race – to take in more Gu gels very early on. Around 6.00am I drove off through the morning light feeling much better and considering shares in Imodium as it appeared to have produced a miracle instant fix. I turned on the audiobook I had been listening too – the biography of Steve Jobs and soon came to the very end of it. I had spent the entire book really not liking the guy but at the end the biographer gave Steve the last few words and in them he discusses the possibility of life after death. I won’t spoil it for you but suffice it to say my face was streaming with tears and I thought …he ‘got’ me or rather I ‘got’ him at the very last minute. It helped my get the minuscule nature of my problem into perspective. I’ll just get to the race and see how I feel. If I can’t start never mind, it’s good to be alive and all that. 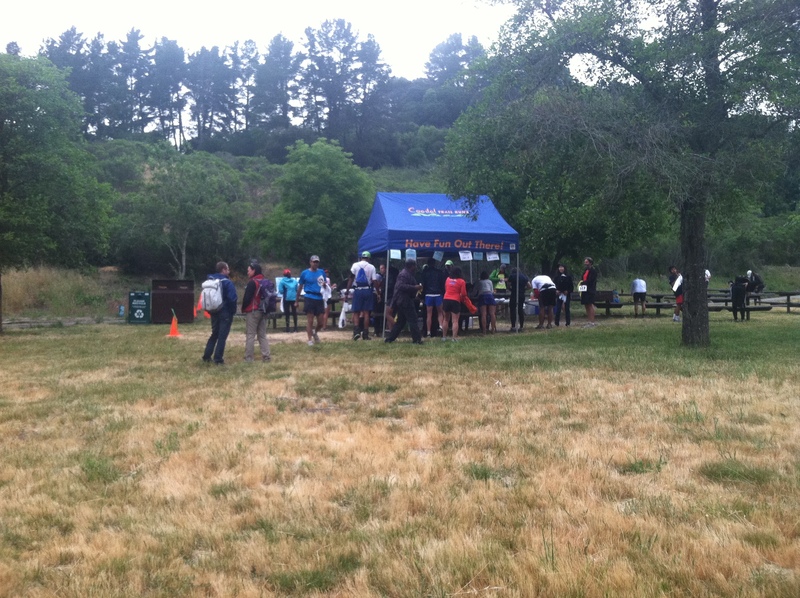 About two miles from the race location in Redwood Regional Park I suddenly had an urgent need for restroom facilities. I looked for somewhere to pull over and seek relief in privacy but there was nowhere. It seemed sheer lunacy that I had left home. How was I going to transport myself from car to toilet without some form of explosion?. I paid my $5 and drove through the park entrance around 7am. I felt ludicrous. Have I really just driven 27 miles to use a restroom ..possibly several times ..and go home. Fortunately, oh joy… I was directed to park right beside a restroom…and there was no queue. One high speed sprint and I was saved. I remained there until I was sure it was safe and suddenly felt pretty confident again. I strolled up towards registration (might as well) while surfing the net with my iPhone trying to find out how long it takes Imodium to work. I dare myself to register.. I might as well get my race bib just in case a miracle happened…and gradually it seemed possible it had just happened. But no – as I returned to my car the torrent continued. I hightailed it to the restroom and proceeded to pay a visit, rejoin the queue and repeat this for 7 times. What was I thinking coming here? Running certainly didn’t seem an option. I was more anxious about coping with the drive home. During this time I received the gift of a friendly and familiar face – Adona Ramos. Adona, lovely lady. 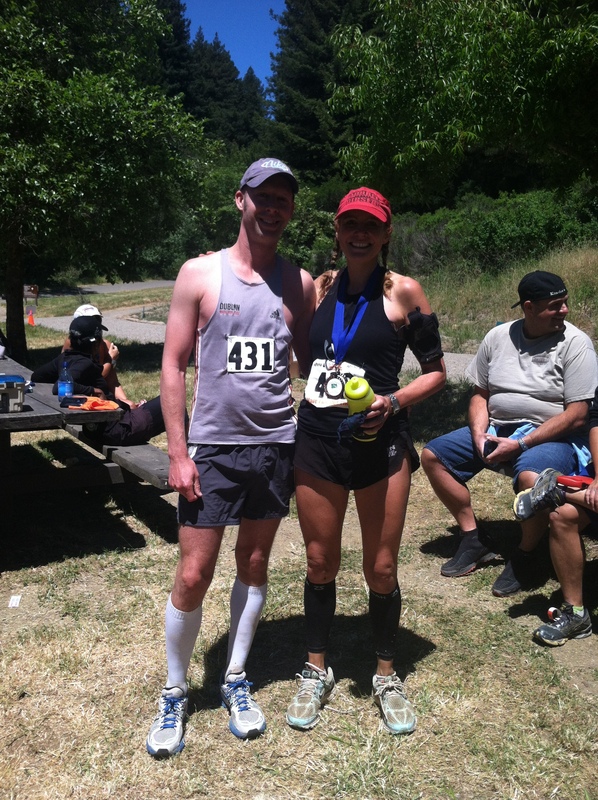 Finishing – first lady and course record in the 30k. 2.36.37. Beautiful looking lady with an amazing petite figure resplendent in bright purple. This is what I would like to look like as a runner- I always seem to look more along the lines of a Russian shot putter who has been roughed up. We have raced together before and run about the same pace but she prefers the 20mile/30k distance. As she did the last time we shared a race she won her distance that day and set a new ladies course record. And looked chilled and immaculate at the finish. We started chatting about my ‘challenges’ and eventually the line of ladies were joining in and roaring with laughter. The conversations and good humour kept going as people came and went but I remained. The spirit of those ladies really helped, I had at least 20 people committed to creating a distraction if they found me in a compromising position on the trail. Two of them even sang for me during one visit to cover embarrassing noises. Ten minutes before the start I suddenly felt good to leave the restroom. 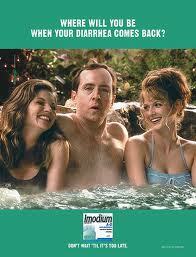 Am I now protected by the power of Imodium I wondered? I took myself on a bouncy jog to see if anything disturbing happened. A couple of ladies who had been at the restroom earlier applauded my effort which made me laugh..also a valuable test and also successfully passed. It really seemed ok. Either the worst was over or it would suddenly hit me again in about 30mins. That seemed to be the pattern. I watched myself join the top of the start line 2 mins before kick off – nothing seem quite real. I was on auto pilot. Somehow I had decided to have a go. If things went wrong I was equipped to deal with disaster and I had a plan – namley run into the forest , hide, and emerge after everyone had passed and sneak back to my car. Off we went. This course starts with a very challenging hill. I thought it had quite a nerve being on a c. 3,000 ft elevation course (this now looking something like a bowling green in the expectations of my imagination). Unlike many trail races though, this remains a generous fire road so there is no need to kill yourself to get to the head of the pack for fear of bottle necking. I took it fairly gently and tried not to be alarmed by the number of people passing and ahead of me. It is important to remember people are running shorter distances, here there were 5 milers, 30k, half marathoners and 50k runners all masqueradering as fellow marathon competition. After a while the hill continues steadily up but is broken by a few little downs and flats and I felt myself recovering and getting into a rhythm. At the turn off for the 5 milers I had no problems re. ‘ you know what’ and was filled with gratitude to be able to follow the pink ribbon marking the half marathon course. I smiled to notice it was one of those rather mocking turns where the 5 mile yellow points to a shaded whoosh downhill while the longer distances face an arid steep uphill. The 30k and 50k runners were going to love the moment when they got to zoom down that on last leg! Eventually, we got to pretty forest trails and after a while I got to overtake a number of runners on downhill sections. As often happens I found what I call a ‘Flat Stanley’ – that is a person who is great on uphill but not on downs, the opposite of myself – and for mile after mile we separated on hills and met up again on flat sections which was rather amicable. There is a odd ridge top section on this run which was to me unexpectedly covered in deep sand. The hot sun and flat sand combined to make me feel rather relaxed as if on a jaunt to a beach. I was just thinking ..how nice to dig in and eat away a few easy miles on this stuff when I became aware there was a young lady creeping up behind me. This turned out to be 27 yr old Nicki Wells. I am pretty good at knowing not to chase ladies ahead of me this early in a marathon – over exertion beyond what is right for you can often lead to a fizzle later on. But it is another thing entirely to resist speeding up a tad to ensure someone doesn’t over take you. When we all took a sharp right turn off fireroad into downhill single track forest the two of us absolutely shot down it. I felt quite a whoosh of adrenalin. I never allow myself to take risks and run fast on technical downhill like this when I am training and it was a blast, my body was comfortable, I was hardly breathing with the concentration and the lady, Nicki, was right behind me the whole way. It was terrific fun. When we reached a more undulating section we passed a group of hikers who said ‘ well done, first ladies’. This was cool as up until then I had known there were women in front of me but you never know who is doing a shorter course, it appeared all of them must have been 5 milers. The next burning question for both of us was of course was …is this lady doing the half marathon or the full? Nicki Wells – first lady in half marathon 1.47.23. I normally don’t allow myself to ask but this time I did- and she was doing the half. We parted company at the aid station at the bottom of this long down section. She was steaming off towards victory and I needed to fill up my bottle with electrolyte drink and grab a Gu gel…only one of us had ‘that’ long and challenging hill in our near future. Then I suddenly felt very weak, nauseous and dizzy… and my stomach which had been no trouble at all up until now started cramping. The last section of this half marathon course is cleverly designed for a wonderful finish. After a section of straight fire road you return to undulating forest trail with a few challenging ups on it – but the exciting bit is that below you can see a forest road …and on it runners headed towards the very finish. You know you must soon come to a turn-around spot where you pop out of forest onto this road and hammer it home. But my stomach was cramping. I might have to stop at the half marthon stage. I got to the road and could see a wooden shack ahead of me which I guessed was a restroom. I had to sacrifice the time and take a break. Were these cramps the precursor to another torrent of hideousness? I opened the door feeling deflated and laughed out loud. Inside was quite THE most beautiful, clean, sparkling white toilet. Moreover, oh joy.. it became apparent I had no need of the facilities at all. Yeeeees! The time I had wasted was nothing compared to the sense of confidence I had gained. My friend John McKinney tells me Imodium can stop a horse. I think this day it was more along the lines of thousands of stampeding Bison. What is IN that stuff? The Gu gel had given me more energy by now, the cramping eased with a few Winnie the Pooh stoutness exercises (touching toes) and I sailed through the last section of the half marathon course, over a bridge, by a playground, passed some trees, turn the corner and the finish is right there. I soaked it all in knowing how I would savor each part when I was finishing my second loop. As I passed the finish/start area Nicki was there eating watermelon – she had indeed won the ladies half marathon with a time of 1.47.23. This just missed beating the course record by c.5 mins. She gave me a cheerful send off and I started the long trudge up the hill to do it all again. As before I took it slow and steady. Two men overtook me with such grace and ease they appeared to be gliding on a moving walkway but I didn’t give chase, I was just in it to survive now and I was oddly content. I felt like thanking my former self who ran up here nearly two hours ago for being brave enough to start the race and was so grateful to be there. Now a funny thing happened. I did this big bad wolf of a hill, I passed the 5 mile turn off, I headed up more hills that someone had slipped into the course while I had been away and I waited patiently with tiring legs for the undulating bit and the lovely stream downhill. Had it not been for the pink ribbon I could have sworn I was running an entirely different course. Hill after hill after hill. I came across the second man who had overtaken me, Nick Cifuentes (who was to win the 50K) at an aid station and it turned out he was also baffled by these seemingly new hills. Finally, we came to a noticeable down in pretty forest and I had a few seconds rejoicing that the worst of marathon was over when a problem I had dismissed as unimportant suddenly took a turn for the worse. I had two black big toe nails. And ‘these’ little piggies went to a marathon. Market next week. 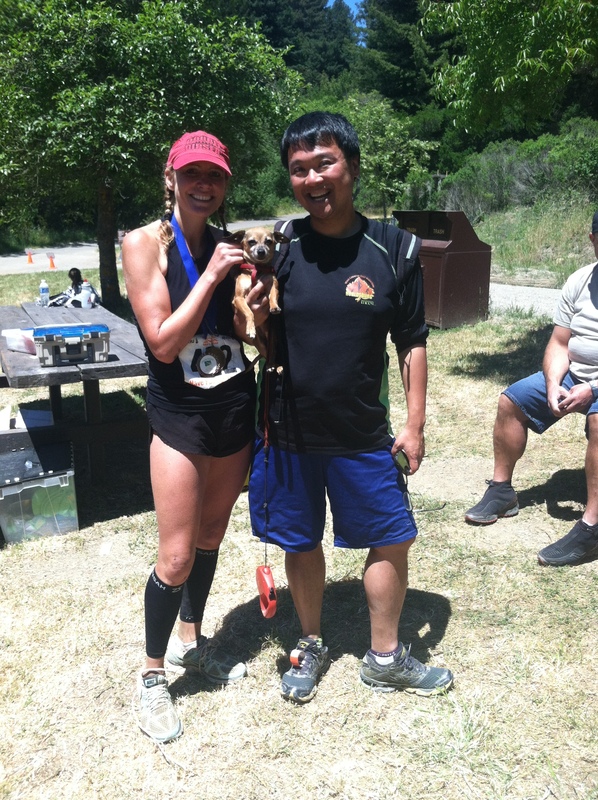 This had happened during the Horseshoe Lake marathon I did two weeks ago. I had been unaware of them until I took my shoes off , they were not painful, there had been no trauma, they just must have been rubbing on my shoes. Now for some reason as I started downhill each step downwards gave me a stab of pain in the toenail. I guess my toes had swollen a little after running for a while and on downhills they were striking the top of the shoe. My back was also starting to feel sore and I was developing a stitch in my left side so when I spurted out onto the flat sandy bit I was uncharacteristically relieved the downhill was over for now. A little relaxing beachy bit would be nice for a while. And here it is…and more of it…and more. Just like the hills, my memory of this bit was nothing like so long. I was just waiting for that sharp right turn into single track forest down. While waiting for it I considered my toenails. I had to prepare myself psychologically for the long steep down I knew lay ahead. There are kinds of pain. This is like childbirth I told myself. Let us view this as a positive pain..I am just loosening these nails and though it hurts it is not damaging me. This is how cute new toenails come into the world. I also diverted my attention to the fun I would have posting whichever nail came off first to my great friend Emma Dell in the UK. Yes really. Many years ago when I was an IT PR consultant and she the Head of Comms at neural networking company Neurodynamics, I had attempted to shock her by first adding a weekly update on a toe blackened from running to our weekly PR report ..and then by mailing it to her once it came off. Not to be outdown – and earning my undying love and admiration – she decorated it with varnish and rhinestones, placed it in presentation packaging and mailed it back to me. Yay I won a dog. With Chris’ friend “Endorphin Dude’ at the finish. Dude indeed- he ran 88 miles last weekend. Hands up if you’re a complete nutbar. 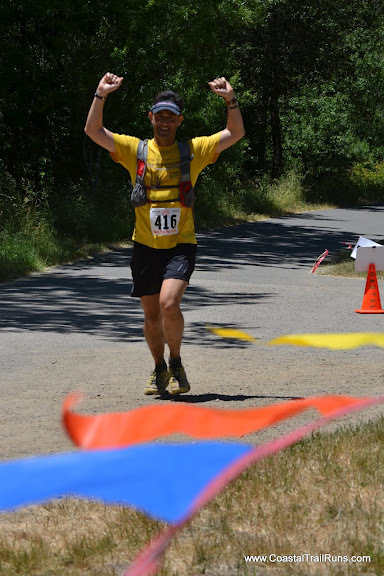 Chris ran 100 miles followed by a marathon last week end. He then tapered into this marathon with a 22 miler yesterday. I found the turn, jumped into the forest and coped the best as I could but my back , toes and stitch rendered me a piteous wreck compared to the splendid duo of myself and Niki streaming down this track before. Just when I thought self pity could not deepen, I turned a corner to find myself at the base of a steep climb the top of which featured three ladies on horseback. It all looked rather precarious. Three shall we say not slight ladies supported by twelve skinny horse legs on a very rough, narrow, uneven, steep single track…a stumble could have them dominoing each other down a hell of a drop ..or have me end my days looking flat, pulpy and covered in horsehoe marks. One lady took command ” ….Now I know you’re racing but you have to stay where you are while we come down’. The voice was not apologetic. It seemed to imply that this might be a good lesson for me in some way. Three and a half years later they glided by me without thanks and I ran off without wishing them a lovely ride. It is of course not the case that runners have right of way when they are racing in an event in regional park land, and you do have to remind yourself of that. Overwhelmingly people cheer you on, remove themselves and scoop dogs and children from your path – but they are not obliged to. I think perhaps I should have been a little nicer. It emerged they had just had a similarly charmless encounter with Nick before getting to me – and doubltess had many more after me. There is a distinct possibility three horse riders in Oakland now think runners are jerks. When I reached the final aid station I was elated. There is always a point in a marathon when you know you can do it. This is the point where I suddenly felt weak the first time around and Niki sprinted off ahead of me. Now it Nick who slowed down here (he had a lot of running still to go being on the 50K) and it was my turn for a last hurrah. Bounce bounce along the straight fire road waiting for the last section of single track to begin. Now on trail looking down waiting to glimpse the forest road where you will be in the last few minutes of running. Then waiting for that turn off the trail and onto the road. I could see a flash of white slipping between the trees …a guy running well ahead of me (this was Andy Burnes) and I gradually closed the gap. He was my homing beacon. When I was on the road I could see him vanishing around a corner and I found myself sprinting towards him…I probably wasn’t moving very fast but if felt like sprinting. Over the bridge, passed the playground, round a corner and there was the finish. Andy finished in 3.54.11 and I was 3.54.19. What a glorious experience, to feel fit and strong, to be able to thunder through the last stretch. It seemed inconceivable that my stomach problems had been the same day. Thank you Imodium! I shall not be ashamed to bear witness to your help. ‘Pieces of Eight’ pose at finish. Feeling a bit emotional at this point. I was so grateful to have been able to run. It turned out that I was first lady, forth overall (it is a very small field I hasten to add – 38 people running, 17 women) and had set a new course record ….by an hour ( this is not as splendid as it sounds as we had a perfect day while last year’s runners has a mud bath!). First man, Stephen Souch came all the way from Montreal to humiliate the lot of us – he torched the course to finish in 3.19.59, also setting an new course record by 50 mins. With first man Stephen Souch.